When we say here at MecSoft Corporation that we are Your CAM Partner we mean exactly that! We strive to ensure that you experience resounding success using our CAM software. We’re here for you from day one and on every CAM project. We are also very proud and excited to be able to showcase a small sample of our customer’s work each year. These projects exemplify how craftsmanship and the right CAM software can merge to produce a beautiful product. They also exemplify each company’s American success story! Read the real true story behind each company, the success they have achieved in their industry and see their projects coming together from start to finish. Learn by example. Read about the CAM toolpath strategies used, the CAD geometry and techniques employed, what materials are cut and the machine tools used to cut them. RhinoCAM and Cello Making at Christopher Dungey Cello Maker Inc.
We also want to give a special shout out to The University of Arizona College of Architecture, Planning and Landscape Architecture Material Labs, whose case study did not make into this year’s publication. 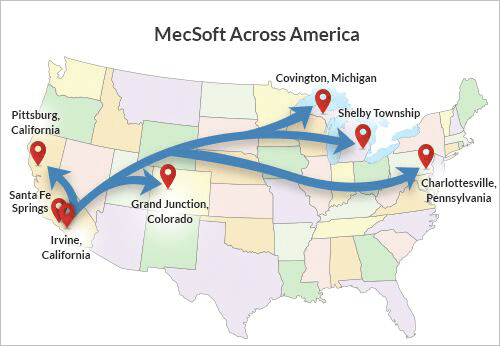 Read MecSoft Across America 2018 Now! Stay with us as we continue to build the future, one CAM user at a time! Brought to you by MecSoft Corporation – Your CAM Partner!